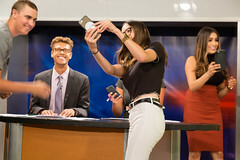 On October 20th a group of 24 PLNU media communication and broadcast journalism students drove up to Los Angeles to tour Paramount Studios and watch a live taping of CBS’ sitcom Man with a Plan. When first arriving at Paramount, the students went to Technicolor, a company that focuses on sound mixing. They were able to enter a soundstage and watch several sound editors make final touches on the upcoming film Daddy’s Home 2. They also had the opportunity to talk with the director, Sean Anders. Bradley Chinman, senior media comm major, shared his thoughts about his experience. Jonathan Malmin, senior broadcast journalism major, also made the trip up to LA. The students then heard from an automated dialogue replacement (ADR) artist. This is the process of recording new dialogue after filming because the original live recorded dialogue is unusable. They were also able to enter a Foley stage and learn from Foley artists who create and edit in all the natural sounds heard in films. While it is not noticeable, these two techniques are used in almost every film seen today. The next stop stepped away from film and into television. The students visited CBS where they watched a live taping of the hit sit-com Man with a Plan. TV is also a realistic avenue for media com majors, and seeing how sitcoms are produced was a very beneficial experience. 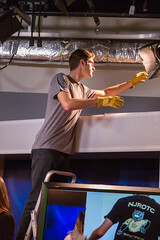 Point TV has hosted several field trips to TV and film studios in the past including DreamWorks Studios, NBC Television Studios, and Universal Studios. 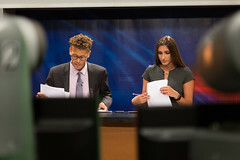 This is something the department will continue to do, as it has proven to be very valuable to students wanting to pursue film or television.